Home » bar reviews, washington d.c. Hours of operation: Mon. – Thu. 10:30 a.m. – 1:30 a.m.
Fri. – Sat. 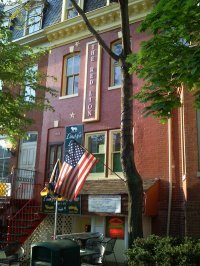 10:30 a.m. – 2:30 a.m.
Mixed in amongst the townhouse facades near GW is an unassuming, narrow little bar/restaurant, up a short flight of stairs from street level, easily missed on the way up or down Pennsylvania Avenue. The primary drawback is that Lindy’s is none too big. Grabbing a seat at the bar can be a challenge, as can finding a table. Up some stairs in back one finds some additional seating in a loft area overlooking the bar area below, though this also fills quickly. There are patio areas in front and behind, but naturally those are dependant on good weather. Given the quality of the food and the presence of some nice beers, one would gladly swap some of the intimate charm for a fifty-seat annex. As it is, Lindy’s is stuck with said intimate charm, which it fortunately possesses in abundance. Familiar old rock songs are usually coming through the speakers, and a couple TVs do not make Lindy’s a sports bar, but do expand its potential. A symptom of Lindy’s size-deficiency is a lack of exposure. There is a Facebook page, for example, but no website, per se. This shortage of advertising may keep the bar from bursting at the seams with flocks of beer and burger fans, but it also means information – new menu items, what’s on tap, etc. – is hard to find out without coming in the door. With a university on Lindy’s doorstep, expect to see lots of students filling up on the burgers and beer. With a few $2 food specials (chili dogs, etc.) and beer discounts, it’s a good after work (or school) stop. The bar staff are also friendly and as attentive as possible, but it is a good thing that there isn’t space for more patrons, or quick service would become impossible. And so it seems Lindy’s is set on being a fan-favorite for locals and GW students, which of course is just find. But others should try to stop in, if just to enjoy a friendly, semi-dive atmosphere, some good food and beer, and a never-ending stream of classic rock wafting in the background.